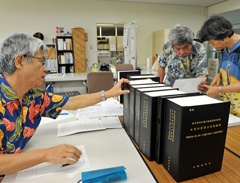 In the morning of June 28, at the Prefectural Administrative Information Center, residents read the documents for the reclamation of the coastal area of Henoko, Nago. On June 28, the Okinawa Prefectural Government (OPG) made available to the public the application documents that the Okinawa Defense Bureau submitted to the OPG for permission to reclaim land at Henoko. They will be available for three weeks until July 18, at eight places, including the OPG Office, the Nago Municipal Office, and its branches. The OPG has also released the application on their website. The documents reveal that the cost of the reclamation is estimated at 231 billion and 87 million yen. The total construction cost, including that to build the air base is not given. The documents are six volumes totaling 8,800 pages, including the Environmental Impact Statement. Flow of the application for reclamation. This clearly sets out the annual budget and work plan for the five-year period of the project. During the inspection period, the OPG will accept opinions from people concerned. The amount of earth and sediment for the landfill will be 21 million cubic meters. The Okinawa Defense Bureau is collecting material for reclamation at Motobu and Kunigami and 15 locations in other seven prefectures, including Tokunoshima in Kagoshima and Moji in Fukuoka. The documents include maps showing the diggings and routes for transportation, but do not give the actual amount taken from individual locations. The Defense Bureau gives the results of soil analysis at Camp Schwab and around Henoko Dam, but does not provide them for the 17 million cubic meters of earth and sand that they will buy both in and outside of Okinawa. They will provide that information after completing the contract. The bureau plans to analyze the soil and will report on the results after all the application procedures are completed. The OPG will review the application documents with over 80 percent of the soil still unanalyzed. The Environmental Impact Statement submitted with the application is the same in content of that submitted previously. The Okinawa Governor has stated that under the current plan it would be impossible to protect the environment around the site. The bureau provided a letter in which the Nago Municipal Office disagreed with the reclamation plan based on the Public Water Body Reclamation Act. Nago claimed that the reclamation work would hinder the functions of the breakwaters of Henoko Fishing Port. On June 28, the bureau stated that it would be able to go ahead with the construction without Nago Municipal Office’s approval.